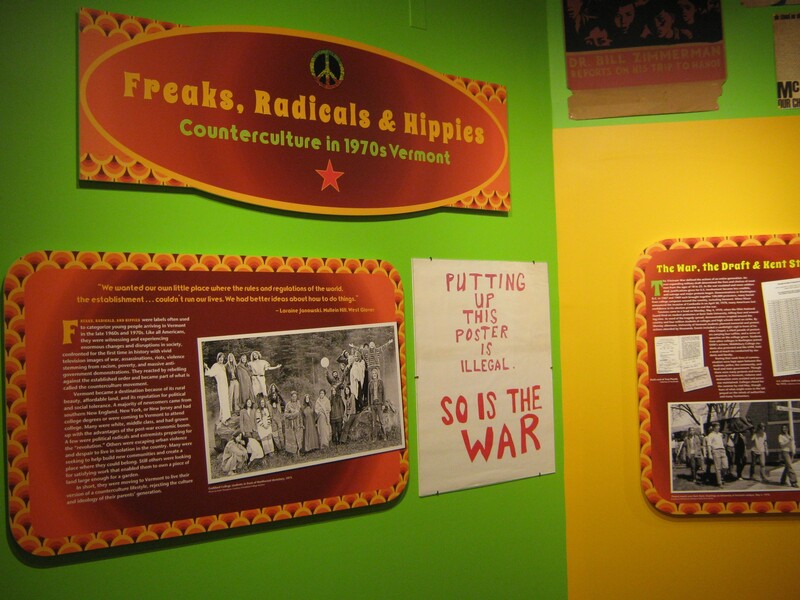 Vermont Historical Society’s current exhibit, Freaks, Radicals and Hippies: Counterculture in 1970s Vermont, suggests that the American local and organic food movement, now so vital across the United States and Canada, had its beginnings, in some good measure, in the back-to-the-land movement, which was a big part of the counterculture in 1970s Vermont. This fascinating exhibit, which opened in late September 2016, will be on display for nearly a year, until September 2017, at the Society’s Vermont Heritage Galleries at the Vermont History Center in the historic Spaulding school building in Barre (Washington County) less than 10 miles from Vermont’s capital city, Montpelier (Washington County). 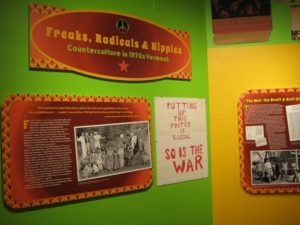 In preparation for the special exhibit, a “counterculture archive” has been created by the Society which will be preserved. Curator Jackie Calder notes that the oral histories, artwork, objects, photographs and documents will become a part of the Vermont Historical Society’s permanent collection and will be accessible to researchers. Over 50 oral history interviews were collected in 2015 and 2016, and are available on-line as part of the Vermont Historical Society’s Digital Vermont project. Still, the three huge objects of “material culture” on display, which grab the visitor’s eye, are not actually food related. 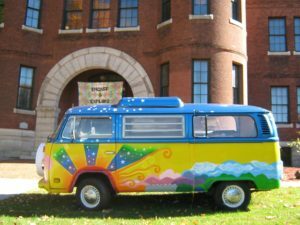 On the sloping grounds outside the Vermont History Center’s Spaulding school building is a colorfully painted old Volkswagen bus. You immediately know you’ve come to the right place for an exhibit focused on the 1970s Vermont counterculture. 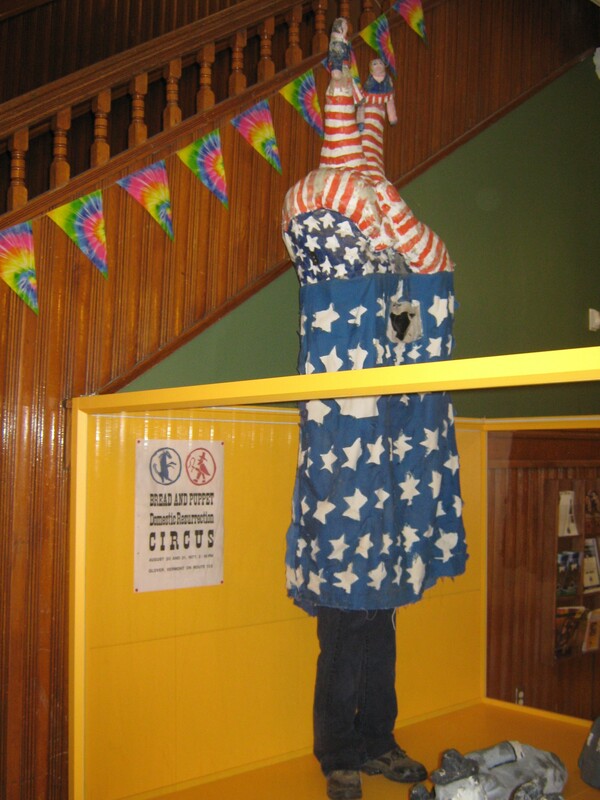 Inside the entry way, is an extraordinary Peace Hand Puppet from Vermont’s Bread & Puppet Theater. Founded in 1963 on New York City’s Lower Eastside, in 1974 Bread and Puppet moved to a farm in Glover (Orleans County) in the Northeast Kingdom of Vermont. And inside the actual exhibit in the Heritage Galleries is half of a geodesic dome, striking to this visitor who has been intrigued of late by the remarkable Growing Spaces® Growing Dome similarly shaped. It’s a shape that is said to be “the strongest structure in the world” according to information on Growing Spaces website. Udgar Parsons, founder of Growing Spaces, based in Pagosa Springs (Archuleta County), Colorado, in words that echo 1970s Vermont counterculture, notes that his small company’s geodesic dome greenhouse kits “demonstrate a solar self-sufficiency that keeps fresh food on the table, even within the challenge of environmental and economic changes.” It might now be said that the geodesic dome has become “food” related in 21st America with Growing Spaces’ greenhouse kits. The main exhibit area includes video and listening stations which “showcase” stories and images from the era. This visitor enjoyed particularly the stories and “oral histories” at the video and listening station for Food: Access, Health, Security. One counter holds pamphlets, petitions and leaflets left by patrons. 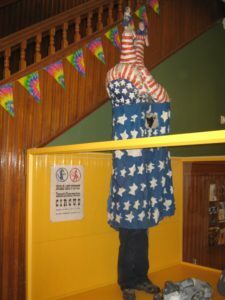 Recently it held a flier calling for the boycott of Chilean wine and fruit; an exceptionally polite petition asking the United States Government to ‘encourage the Chinese Government to stop their human-rights violations in Tibet,’ and campaign literature for Mayor Bernie Sanders of Burlington, Vt., a Socialist candidate for Congress. There was a collection box inscribed with the phrase ‘a quarter a day to keep the Contras away. Ms. Callan sold the Horn of the Moon restaurant in 1990 and it closed its doors a few years later according to an article by Dot Helling in The Bridge, Montpelier’s independent and local newspaper. Yet as of the date of this post, the Horn of the Moon Restaurant Cookbook is still available on Amazon, a new copy for over $50.00 but some used copies are reasonably priced. Other stories to hear at the listening station on food related subject matter include Diane Gabriel’s emblematic account on how she moved in 1969, when she was 22, from a Bronx neighborhood near Yankee Stadium to Fayston (Washington County), Vermont. In Fayston, she became interested in new ways of growing and preparing food, including the use of cold frames, canning, drying apples, and cold storage of root crops. Home-made granola and grinding wheat berries to make bread became part of daily life. 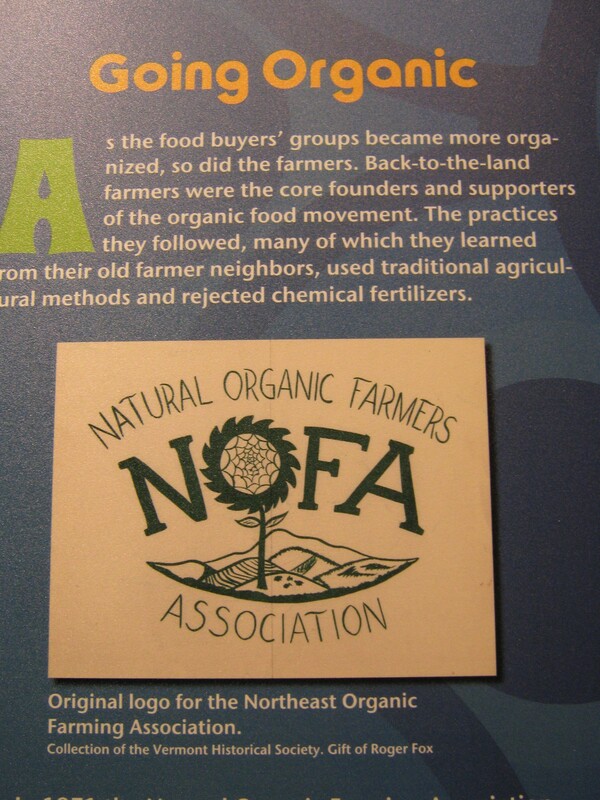 Stories are also told on how food buying groups evolved into food co-ops. Onion River Co-op in Burlington (now City Market/Onion River Co-op) was started up first by Larry Kupferman and Susan Schoenfeld as a food buying group. 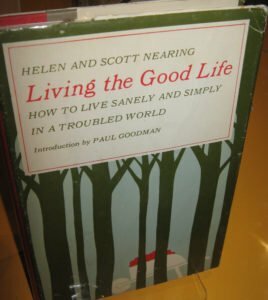 Plainfield Co-op was propelled into existence by Goddard College students. 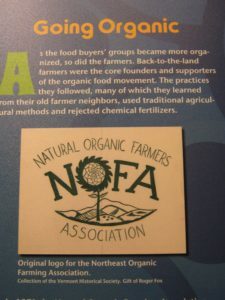 And the history behind the establishment of NOFA (known as the Natural Organic Farmers Association back in the 1970s, and now as the Northeast Organic Farming Association with state chapters today in Connecticut, Massachusetts, New Hampshire, New Jersey, New York, Rhode Island and Vermont) is fascinating. According to Bob Light, who was involved at the start, the lack of farming knowledge was a challenge in determining ways to grow vegetables organically and to deal with insects and weeds without the use of pesticides and chemical fertilizers. Time is also well-spent hearing the stories related at the listening station for Living Collectively: Founding and Philosophy. 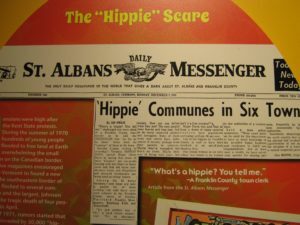 The exact number of communes in Vermont during the era “may never be known” since they often didn’t last longer than a few months or years. At most, it is estimated that there may have been as many as 100 communes or collectives, with a year-round population during the early 1970s of up to a few thousand people. Rock Bottom Farm: Study of a Commune, a 32-minute film by Thomas Lane and Gary Osmond from 1972, courtesy of the Dartmouth College Archives, tells the story of a commune started by Woody Ransom in South Strafford (Orange County) Vermont which had pigs, cows, sheep and chickens in addition to growing vegetables. 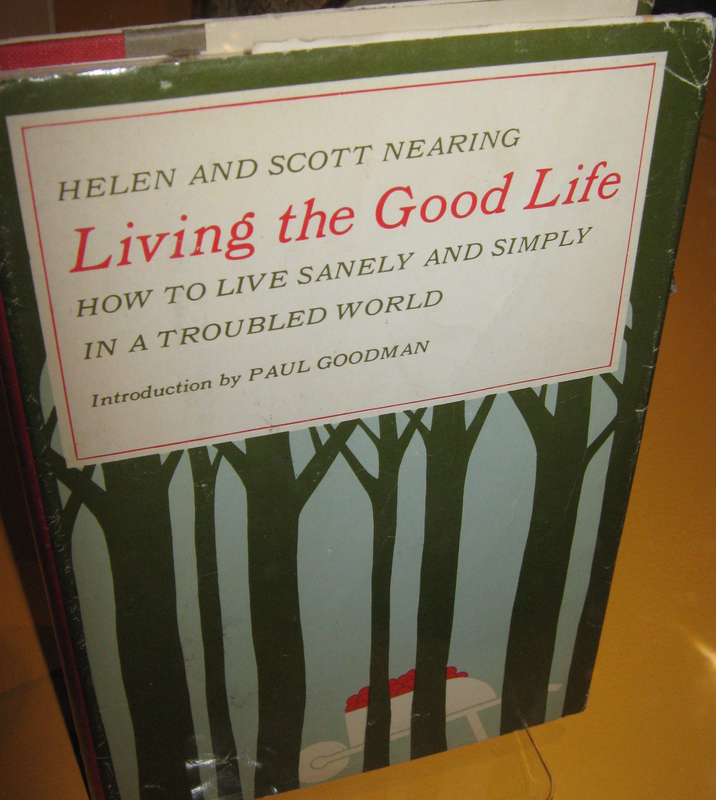 Many people believe that the influx of new people ruined the state forever. Others believe that the state was saved by these newcomers, who brought invigorating ideas, politics, and social mores to a state that had been in serious decline. 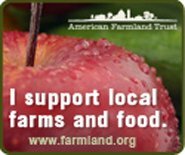 The many Vermont listings on this website for CSA (community supported agriculture) farms, cheesemakers, farmers markets, farm to table restaurants, craft bakeries, etcetera, lends support to the more generous view of the “others” noted above. The numbers are stunning: our directories for Vermont include information on 60 CSAs, 41 cheesemakers, over 60 farmers markets, over 60 farm to table restaurants and six craft bakeries using local grains milled into flour. And this explosion of environmentally and socially conscious enterprises are all rooted in the second least populous of the U.S. states, the Green Mountain state of Vermont with its 626,562 inhabitants at latest count. This inspiring local and organic food culture can be a model for citizens of other states to embrace. In the vanguard in the transformation of the way Americans (who care about their health, environment and local economies) produce, buy and consume their food, Vermont has bushwhacked a path away from the industrial/commodity agriculture system and provides hope for an American agricultural future that sustains the health of people, communities and the environment. 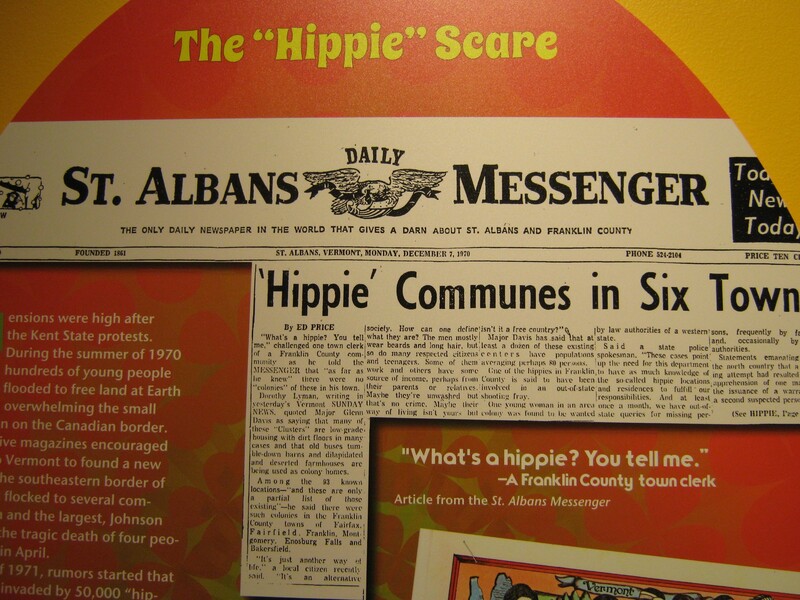 Kudos and gratitude to the Vermont Historical Society for its recognition and preservation of the memories of the back-to-the-land-movement in Vermont of the 1970s and the mounting of its fascinating exhibit.